Well, I basically look a bit like I've been plucked from the 90s. But this top is ideal for SS13. Stripes AND monochrome. Probably a bit early to the party, but that's how I roll (it's all good, I get to drink all the punch and take all the nibbles before anyone else gets to them). Black and white striped jeans were on many-a-legs a few months ago. So it does make me wince slightly at both monochrome and stripes being top of the trends for the coming season. 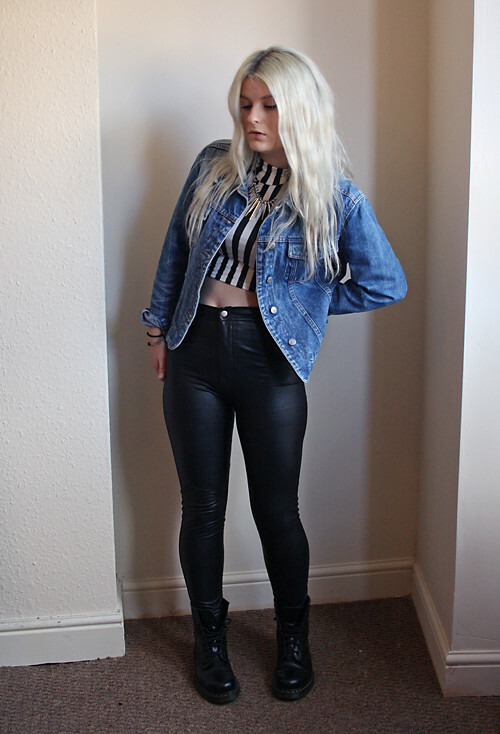 Just because those jeans were a bit annoying (just like how disco pants are annoying, yet I still wear them. Hypocrite - yes). I'm quite a fan of loud tops at the moment, so this turtleneck, beetlejuice-y number is just my thing, despite the pattern. It's quite chilly to have my pasty old midriff out at the moment so I did throw on my trusty fur coat before venturing out like this last weekend! Oh, and my boyfriend endearingly chanted 'BEETLEJUICE BEETLEJUICE BEETLEJUICE' at me when he saw me, hence the title. Love this outfit, especially the top with the necklace! Beetlejuice, Beetlejuice, Beetlejuice! <3 Loving the denim jacket. Check us out, Karma Clothing twinnies! You look SO amazing, I swear you can pull anything off! I really love that turtleneck!! Dayummmmmm girl! That's all I have to say. you are rocking that top! 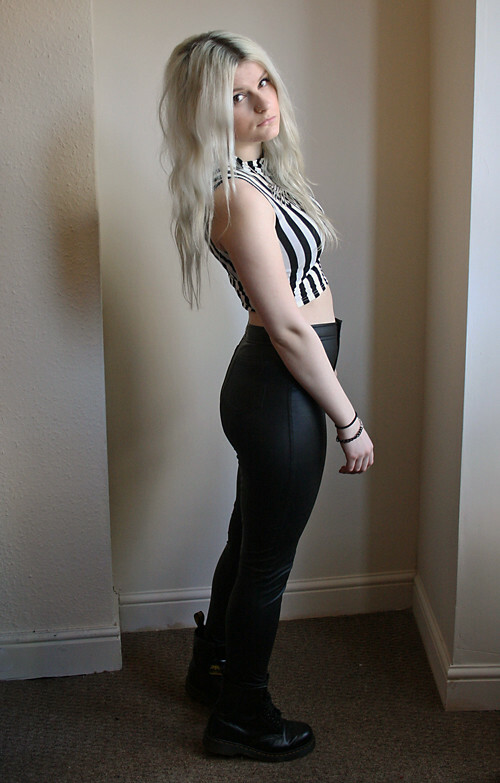 Love the crop top, really into monochrome and 90s right now! You look gorgeous Robyn! I'm like you, much prefer the stripe tops than trousers. You look effortlessly cool, and what a gorgeous figure girly! P.S. Just seen you were in more mag, I'm doing that in a few weeks eeek! Well exciting! Any tips? Hey I just found your blog and love your style :) now following you! You look absolotly gorgeous love that jeans jacket and those leather pants! I love your outfit :) Looks great on you!